So you're part of a cycling team who's signed up to race a Zwift KISS Racing League.... but you haven't used Zwift before!? You'll need to cover a few bases first before clipping in and rolling out for your first virtual peloton experience. Here's my comprehensive resource guide to take you from ZERO to virtual HERO in your pain cave. Note: Some of these resources have the older Zwift branding and setup screens. The principles and information are all still accurate and relevant today. The KISS Super League will require use of a Smart Trainer as the power source as well as a heart rate monitor for rider verification. Connecting these devices depends on what you're running the Zwift application on. Bluetooth Smart devices connected to mobile devices or AppleTV pair in much the same way as ANT+. The Zwift application does the paring process. RACE TIP: Remember to enter your correct user details for the KISS Racing Leagues. This includes Name, age, height, and weight. You should also complete a few rides to familiarise yourself with your equipment and establish power baselines. Trainer mats, fans, side tables, towels. It's important to have an optimal environment for training and racing indoors. Here's a walk-through of two premium indoor 'caves'. RACE TIP: KISS Super League events will all be easily identifiable in the Zwift Companion App. If you're part of the KISS Super League you'll be automatically enrolled in the race events. When you log in you'll see "JOIN EVENT" button in the bottom left of your screen. DO NOT click the "Leave" button for your race event from within the drop-in screen. Doing so will prevent you from automatically joining the race. If you mistakenly click the "Leave" button, you must restart the Zwift application to properly join the KISS Super League race. It's up to you and your team how the races play out. Hold the wheel, attack, counter attack. It's bike racing as you know it. Uploaded as a reference - All the available data fields you can configure on the Wahoo Elemnt / Elemnt BOLT Cycling GPS as at 13th August 2018. Static weight calibration of a Quarq S-Works Spider ANT+ power meter. 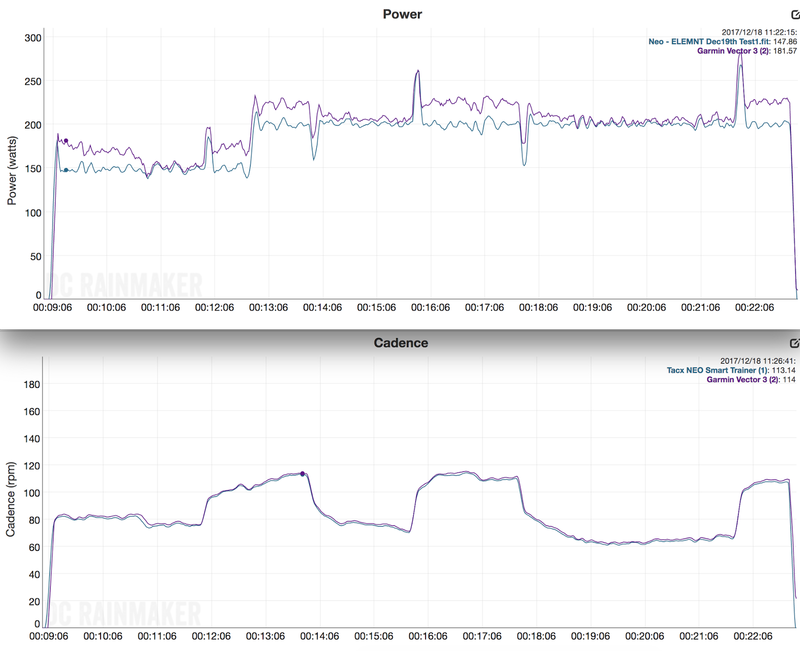 Here's a brief run-down of a day of testing trying to get to the bottom of why I'm seeing some major differences in power numbers (well beyond the maximum combined margin of error) when putting my Garmin Vector 3 Power Meter pedals up against the Tacx Neo Smart Trainer in steady state ERG mode. After receiving my Vector 3 pedals (retail/production) last week, I installed them as per the manual, went 45km ride outside on them (sprints, etc to bed them in, then performed my standard Lama Lab Test on them with the Tacx Neo Smart Trainer (control/baseline for power and ERG). The full ~16 minute video is over on YouTube. 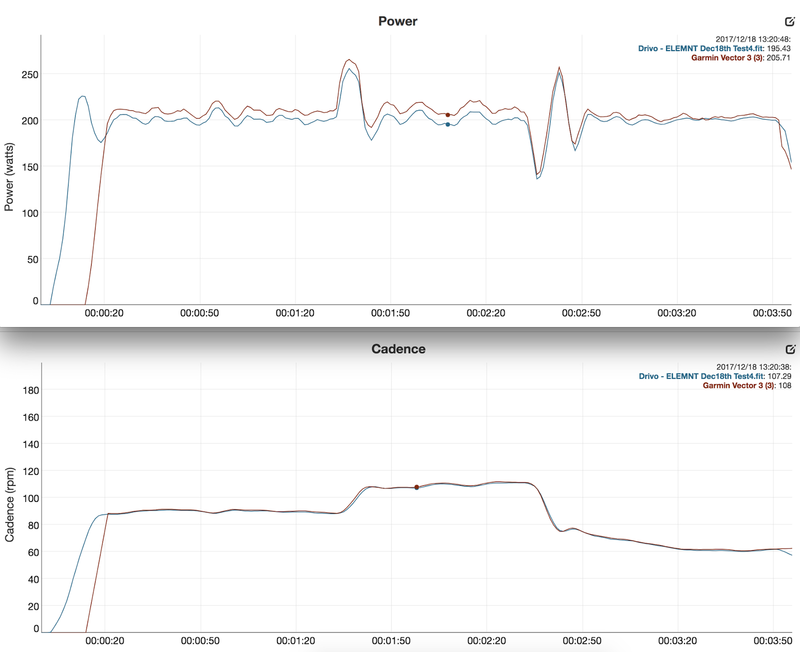 Aside from the no-show for Bluetooth power meter support (at this stage) the other glaring issue was the +20W discrepancy between the Tacx Neo and the Vector 3 at 200-220W during a sustained ERG effort. This discrepancy is greater than the combined accuracy error margins (Neo -+1%, Vector -+1%, and a generous drivetrain loss estimation of -+5%). What was strange is this difference wasn't seen when 'just riding along' or in a continual ramp test I performed in SIM mode. So it wasn't going to be a simple calibration/zero-offset fix. Cadence. 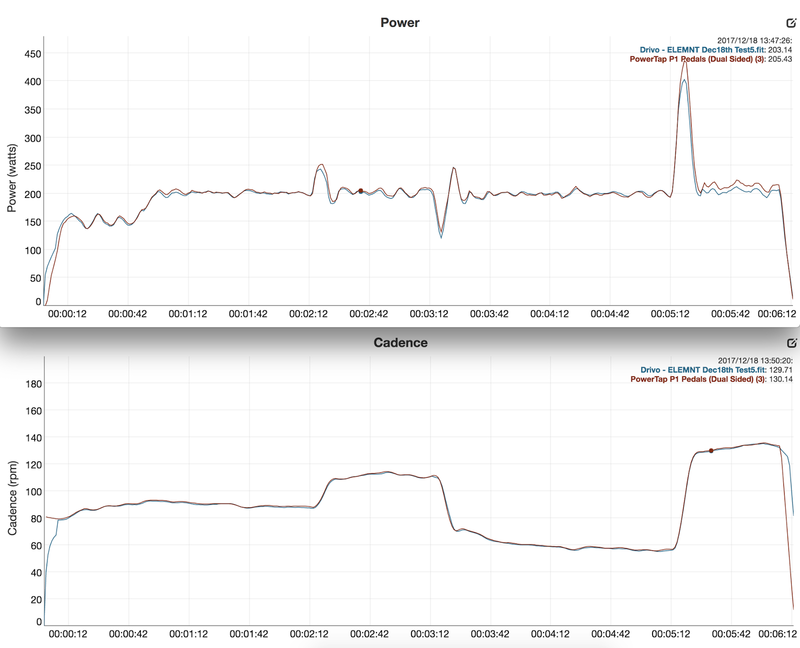 What was the impact of changing the pedalling cadence on the ERG mode power readings, using the same gear? I typically pedal at 90-95rpm for my ERG mode tests and haven't seen any major power reporting issues in those zones... until now. 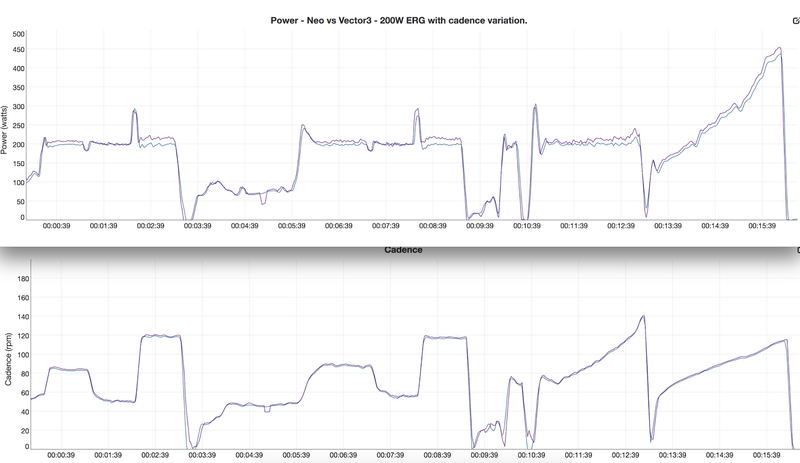 - The higher the cadence, the more the Neo and Vector 3 disagree on power. - Cadence under 80rpm shows acceptable accuracy ranges. 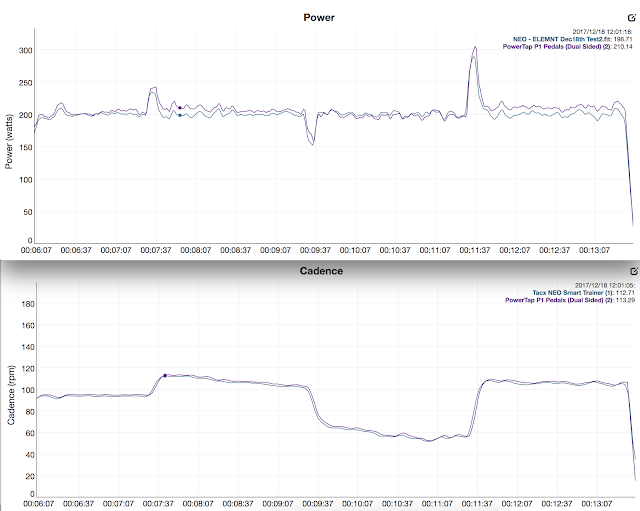 - Cadence greater than 100rpm results in power reporting up to +20W from the Vector 3. - ~+10-12W differences in power reported at higher cadence ~110 (Vector 3 was ~+20W). - Lower cadences ~60rpm appear optimal for having the Neo and P1 agree on power. 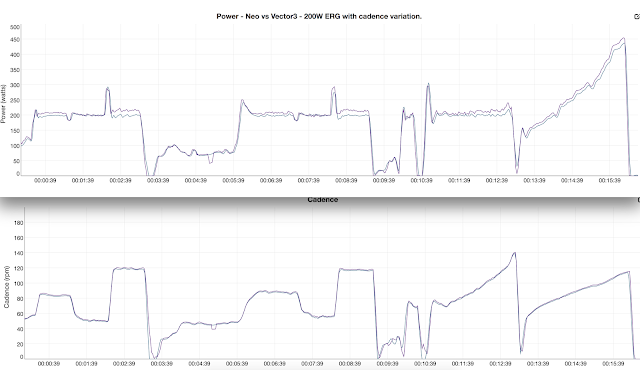 - Lower cadences ~60rpm appear optimal for having the Drivo and Vector 3 agree on power. - NICE!.... Only start to see disagreement at 130rpm+. ERG is a strange beast. It's never a constant application of resistance from the Smart Trainer. It'll oscillate slightly above and slightly below the set target watts as the very inefficient human motor stomps away on the pedals. This means the power measurement becomes a complex task. 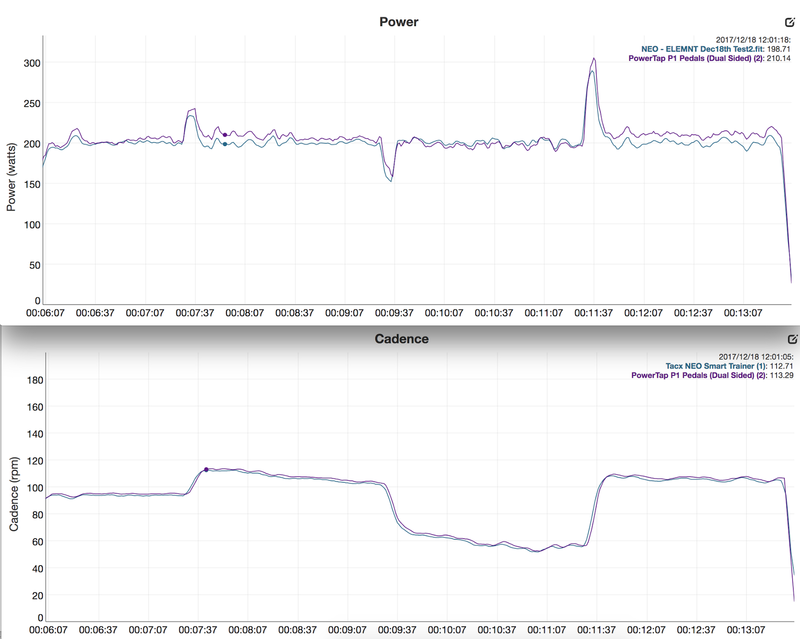 - The power reporting of the current Vector 3 pedals (Firmware 2.30.0) appears to be influenced greatly by cadence when in steady state ERG mode on an indoor trainer. 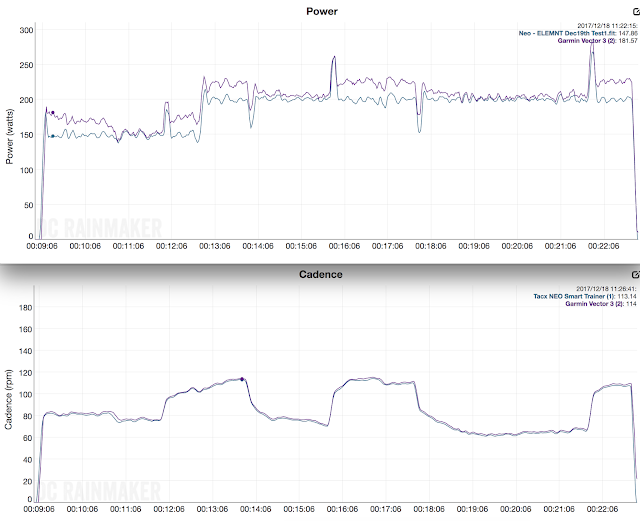 Lower cadences appear to match smart trainers with power accuracy ranges of -+1%. - The PowerTap P1 pedals appear to also suffer from high rpm power reporting differences, but at much higher RPM than the Vector 3 and with a smaller margin of error. Could this be related to sample rate at which these power meters calculate power? Side thought..... The PowerTap P1 are compatible with oval chain-rings, which means they're doing some high sample-rate and averaging due to the changing velocity of the pedal stroke. Is this why they have the edge over the Vector 3 (no support for oval rings) for these higher RPM ERG tests? 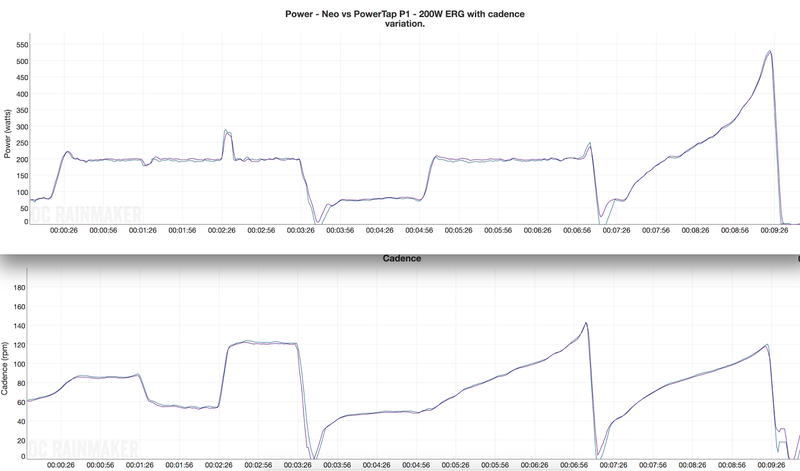 My focus here is on understanding what's happening with the Vector 3 pedals, I also have a suspicion the Tacx Neo itself starts to struggle with power reporting at higher RPM ERG efforts. I did have a Quarq power meter on for a number of these tests..... but I've omitted that for now as I focus purely on the pedals vs the world. As always... more data needed. Stay tuned. Because this is 100% doing my head in. R: 33.41, 33.50, 33.47. 33.46 avg. 98.86% of calculated Nm. L: 33.66, 33.59, 33.72. 33.65 avg. 99.42% of calculated Nm. Test 9 - Vector 3 | Tacx Neo. 39/15 gearing. No gear changing. Head units: Garmin 520, Garmin 820. 1 second recording. Latest firmware on both. - Cycling Dynamics turned off at 5min. The raw data files should be accessible on Ray's site for download / further review. In summary and for clarification - I really want the Vector 3 to work, just as well as the P1, it not better. I won't rule out the Neo, my testing protocol, my wonkyness at higher RPM on L/R, maybe the moon phase.... I just can't explain or resolve what I'm seeing with the readings. - Installation torque? I'm snugging them on just as tight as the P1. - Interface between the pedal and the cranks? I've tried with and without the 2mm washers, no change on the Ultegra 6800 cranks. - Cleats?.... I'm running 6deg float on V3, 0deg on the P1. I have the 0deg Exustar ones here in a box I'm yet to install. - Sample rates.... well beyond what I've got access to see/review/know about. I'll leave that for the engineers. This time last week saw the cancellation of the 2017 Tour of Bright stage race in the Victorian high country. With severe weather warnings and predictions of up to 300mm of rain, the decision by Alpine CC was a tough one, but was the correct one to make. If anyone has descended Mt Hotham in the wet, you'll agree wholeheartedly with their decision. "Up Rosewhite the pace was gentle and steady. At one point an O2 rider beside me asks how many watts? My reply being "too many", watts and speed up a hill is all dependant on weight, so its of little relevance to anyone other than me. I have a chat to him and find out its Mr CyclingTips himself, Wade Wallace. I've followed his web site for a while, and know of him, but never met him. No better time for introductions than up a climb in a bunch of 90 riders!" Wade Wallace (founder of CyclingTips) and I both have a fondness for this race. We'd initially crossed paths in the bunch, and in following years we'd both managed to pull on the Yellow jersey in the Masters 1/2/3 and Masters A categories after the final sage. A post from 2013 on Cycling Tips "Tour of Bright: A Legend Two Decades in the Making" covers the history of this race and some of the successful names in the sport who've pinned a number on at "Bright" over the years. 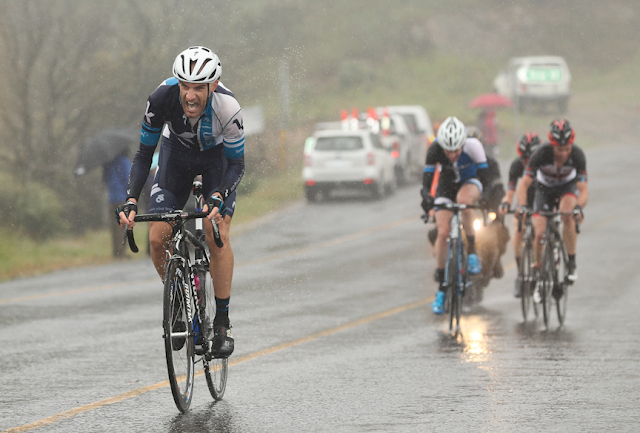 My last memory of racing Bright were back in 2014, finishing the extremely wet Stage 3 Mt Hotham ascent curled up in a ball on the side of the road after crossing the finish line. I've given the race a wide berth in the following years while trying to block out that experience. I'm sure I'm not alone there, it was quite a memorable stage. 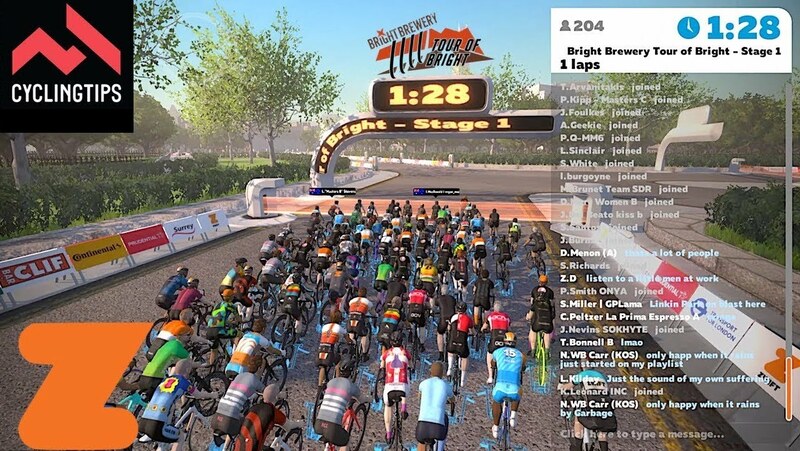 Upon hearing the news the 2017 edition was cancelled, a number of people joked on social media that we shouldn't let all the race preparation go to waste and we should hold a "Virtual Tour of Bright" using Zwift. I liked the idea, however I took it as light humour knowing the effort it would take to make that happen. Within a few hours the wheels were in motion to make it so. Wade had grabbed this idea and had run (ridden, I guess) with it at full steam! With the approval of the organisers, sponsors, Zwift, a number of parties, and 62 emails later - The Zwift Bright Brewery Tour of Bright was in place. Two stages, no official prizes, no entry fees, just log in, clip in, race! I was in! So were over 200 others on the start line of each stage. The offical 'virtual' results are over on ZwiftPower if you'd like to see where you ended up or how the riders went in each stage or in the overall GC standings. 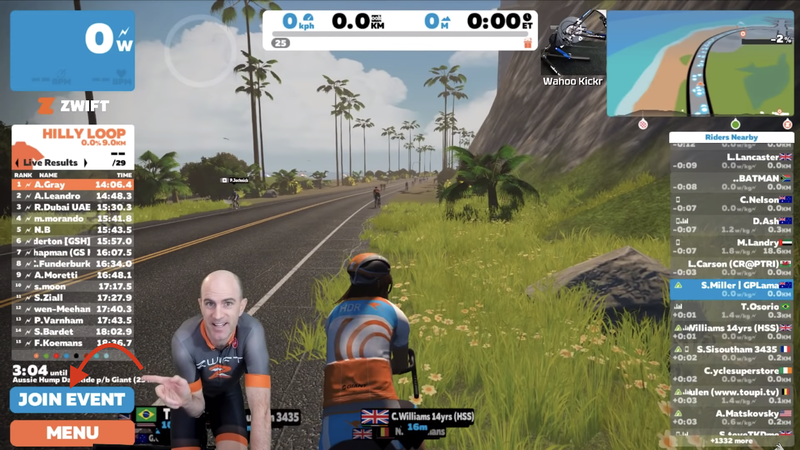 From an event cancellation to the global collaboration between CyclingTips and Zwift - all in only a few hours to provide riders an opportunity to race their bikes, albeit virtually, and for nothing more than to chase other pixel bike riders on their screens. This is everything I hoped this new world of connected technology would be. It's not a replacement for the joy and excitement of racing or riding our bikes outside. That'll never be matched indoors. It's an opportunity to still get that heart rate up, to get those legs burning, and to race that rider next to you for 1st or 101st place rather than sitting on the couch looking out the window wishing you were on a bike.